Among the harvest of my thoughts, I find myself daydreaming of a Lady Flower whom I have not yet met. The light gleaming from her eyes, even though hidden within night's darkness and fantasies, still gives beauty to my dreams. Every heart is shackled by self-pity at times, but only the lonely know the difference between sympathetic sorrow and lonesome tears. 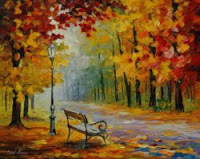 Tenderly, my heart remains devoted to her, for in the nakedness of the wind, I can taste her sweet, feminine scent through the poems I write on this lonely park bench. Every time she gracefully walks upon lifeless grass, her sultry image gives beauty to it under a sunlight blessing beautiful flowers like herself. Daydreaming about this lovely woman helps restore the voice of passion I once lost inside the grave of a broken heart. Today, I cling to the liberty of her enchanting spirit for happiness and in the essence of my daydreams, I imagine reaching for her lips to taste what sweet love really means. Andy, I hope that poem is about your wife...especially when you are out shopping with her LOL. daydreaming a lady during festive season of fall..
To love and be loved.....your writing is majestic. Excellent poetry....you are a genius.Love those lines....specially the second line. This is one of your best, Andy, and that's saying a lot, because they are always good! The music is perfect, too. Beautiful post! Expressive imagery. Well written. Brings a host of emotions. Music is a nice touch. What more can I say.... that has not been said. Am curious as to where you find your inspirations! Beautiful, one word at a time you soften my cynical heart. Thank you! Lovely and love the beginning a lot! Lovely sentiments and imagery! Nice write, Andy. Your posts are always so beautiful and refreshing! I enjoy stopping by. Thanks for sharing your talents here with us. Love that painting! I needed to read this poem tonight - I had just come home, my heart "shackled by self-pity" and it gave me comfort. Thank you, Andy. Thank you. You bring out the best about "LOVE"...Andy...this one is simply beautiful. What provocative thing will Andy have to say this week? It's always a fun read! beautiful. i love the pureness. words that come from you tiny heart. nice...keep daydreaming and keep writing about your daydreams. You daydream in the language of love. Incredible how you find so many ways to write about love. I guess you are living proof that love is limitless. This reminds me of a favorite song of my husband and son's by an American group from the 60s called the Temptations. It's called "Just My Imagination." We all need to dream sometimes. So romantic and so beautiful! Sounds to me like you are writing about the Proverbs 31 lady mentioned in the Holy Scriptures! Loved it Andy. So touching and romantic.. fantastic.. I think this is a beautiful poem; i enjoyed the image it brought in my mind as i read, and i got drawn into the scene. Beautiful and moving. I too find myself in a more day dreamy mood lately. It probably has something to do with the fact that I live in Sweden, where it's been getting darker and darker. In a week or two we'll have only five hours of daylight. That's when the deepest thoughts are thought and the deepest poetry is written. Well done! Hello to new & returning visitors. Thank you all for your kind words. There's nothing more meaningful to a poet than to have his readers enjoy his precious musings. As long as you keep reading, I'll keep writing! Thank you again for your faithful support. If I've not already done so, I shall be returning the kindness soon. read ur bio.omg !more than a 1000 poems! I'have just started out.lots of pick up and learn...lovely widgets all around and visitor friendly too.I'm following u.174th on gfc. To Rohit: Welcome to my blog. Yes...more than 1,100+ poems & counting! Thank you for the lovely compliments about my blog. I'm afraid I cannot take the credit for the design though...that honor belongs to my trusty Executive Assistant, Miss B. Thanks also for following. I always try to return the kindness & will be over to yours soon. Please feel free to stop by anytime. You'll be more than welcome! Wow. Love the graphic and love the romantic longing here. I hope your wife is okay with all the unrequited longing going on here! ha! Thanks for sharing your wonderful talents with us Andy. I always enjoy seeing what lovely direction you are taking us! Hello Jenny. Lovely to see you. I enjoy the camaraderie over at Alphabe-Thursday & the challenge of coming up with a new poem for each week. Thanks for taking the time to stop by...I know you're one busy lady. Andy you are well loved. I also nominated you for the perfect poets award. To William Leed: I am touched & humbled you would nominate me, William. Thank you so much. Hello Melissa. Thank you for the lovely compliment. My joy is having you and all my readers enjoy my poetry. I appreciate you stopping by & hope you will return again soon.